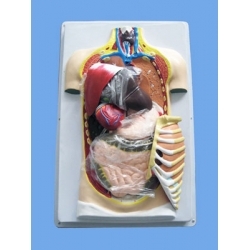 Human torso dissection model, showing internal organs. Consists of the following detachable sections: torso cavity bas-relief, anterior chest wall with a part of lung;diaphragm; kidney with cholecyst; stomach; intestinal tract; heart. Detachable sections can be easily fixed and put off the base. 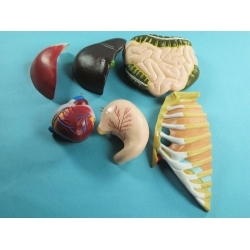 The model allows to show truly and demonstratively the chest and abdominal cavity organs contour, and their collocation. 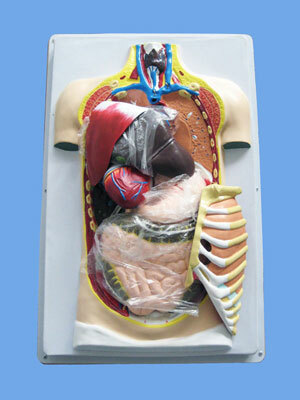 The model represents internals human organs without detailed presentation of nerves and blood vessels intussusception, and methods of organs fixation in living organism. the color coding is used to mark necessary structures. The coloring of all organs is close to the natural one( but a little bit darkly). When coloring heart blood-vessels the generally excepted in anatomy color coding is used - red and blue colors.